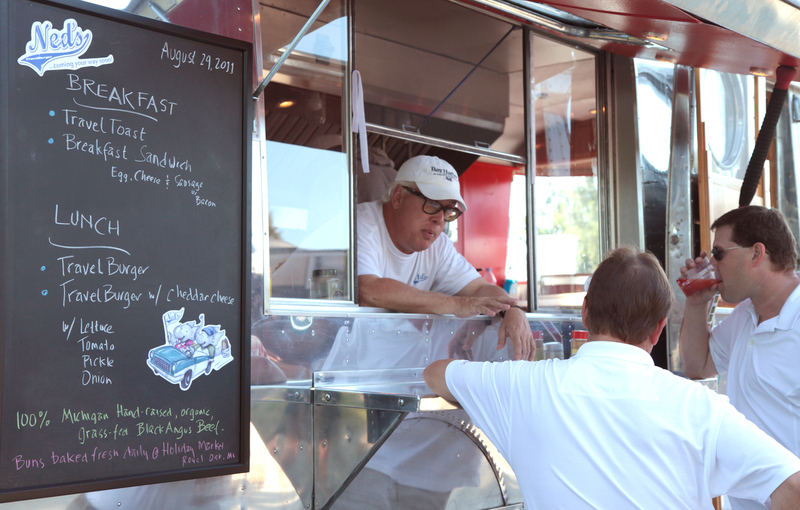 Using a 1946 Spartan Travel Trailer, Ned’s TravelBurger serves up burgers and fries to metro Detroiters. Carl Patron and Scott Steigerwald bought the rig in 2010. To create more head space for the kitchen exhaust system, Patron raised the trailer by a foot. He added a foot-high tub onto the chassis, lifted the shell off of it and dropped the shell back down. He swapped in tandem axels to accommodate the weight of the kitchen equipment carried inside--a 36-inch griddle, a fryer that holds 45 pounds of oil, a sandwich cooler, storage for burgers, and big commercial fridges, sinks and freezers. Stored in the fridge and freezer are organic, grass-fed meats from Fowlerville, Mich., fresh buns from Royal Oak’s Holiday Market and produce from local farmers markets. With these prime ingredients, Patron and Steigerwald create portable lunches for customers. Whether via an Asian turkey burger with five spice and kimchi or a Baja burger with cilantro corn salsa, Ned’s trailer takes customer’s taste buds on a trip.